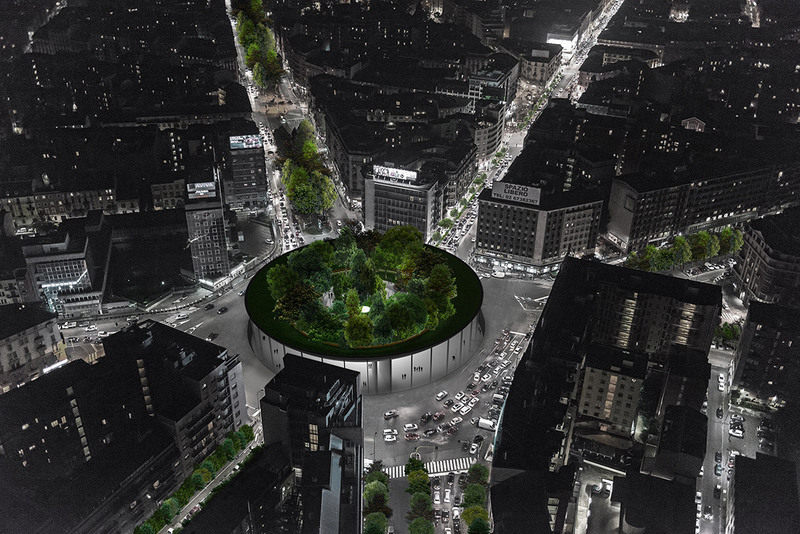 The ” Overpark ” neologism identifies a green area built from scratch above a pre-existing urban function. 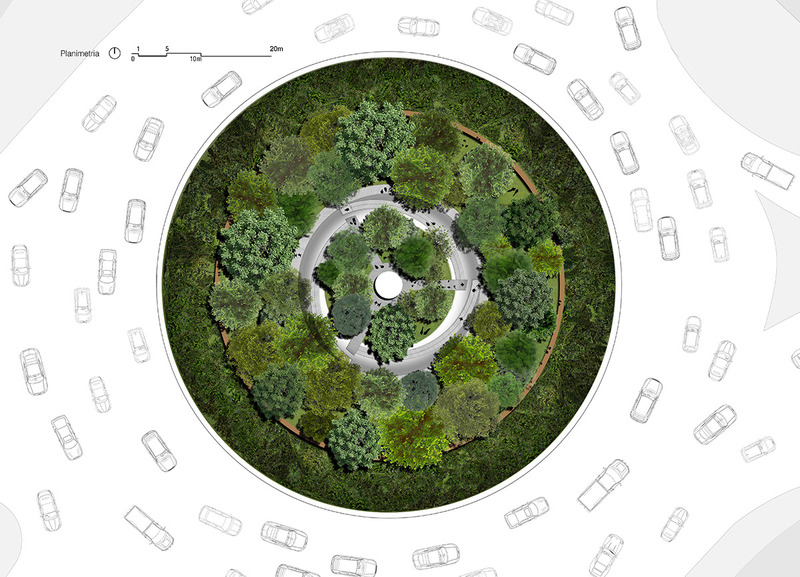 In the context of an urgent need for permeable soil and vegetation for our cities, it is faster to act by addition rather than by substitution. In a city that inside its buildings create mezzanines as soon as possible, creating hanging public gardens is our urban regeneration strategy. 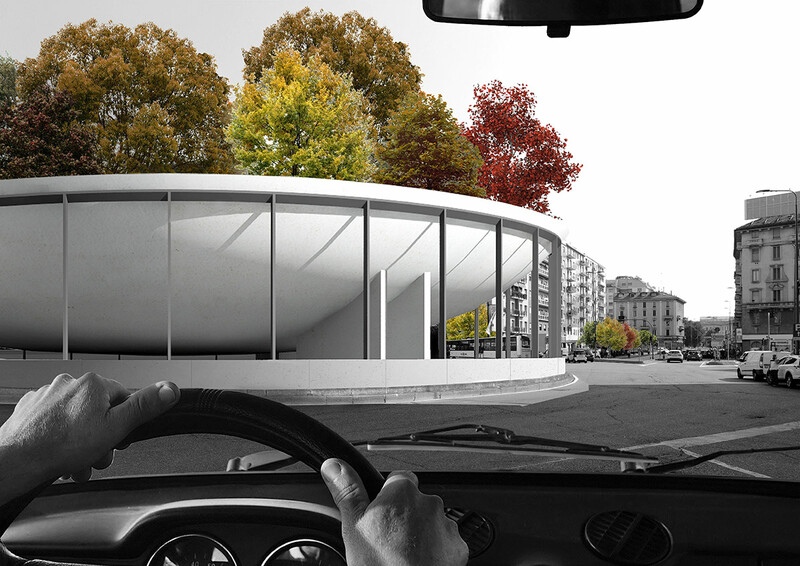 We applied the architectural concept of the Overpark in the context of Piazzale Loreto. Piazzale Loreto is the gateway of Milan, some of the most fast-moving parts of the city gravitate around it. Unable to impose on the owners aesthetic upgrades of facades or renovations of the entire buildings, the project radically rethinks the central space to drive the conversion of what belongs to the private sector. Under the street level, there is an important junction of the Milan underground, though it never has acquired the rank of a station. Enormous flows of people pass through it every day, restricted inside narrow tunnels. Uncovering the mezzanine level we obtain a wide and airy plaza, capable of connecting parts of the city which today are closed off. Beyond the metropolitan access, the plaza is equipped with stores, coffee shops and restrooms. The center of the plaza is deliberatedly rather empty: it is free and available to be used by citizens. 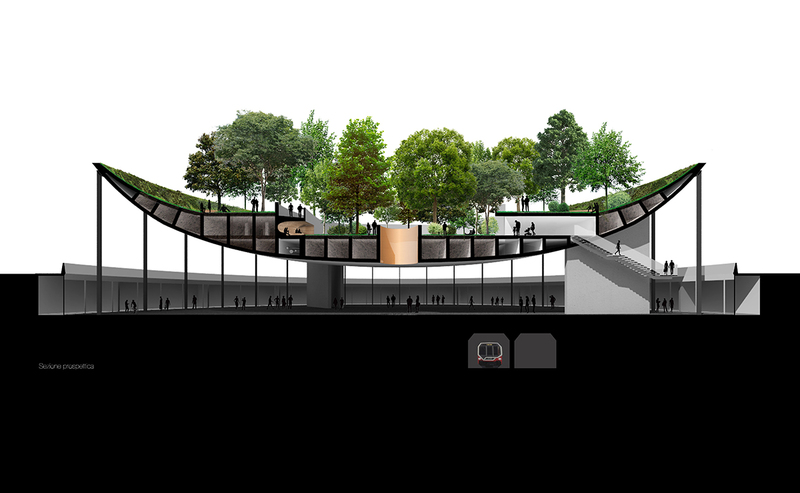 As we said, the neologism “Sovrapaco” (Elevated Garden) indicates a green area built from scratch upon a pre-existing urban function. 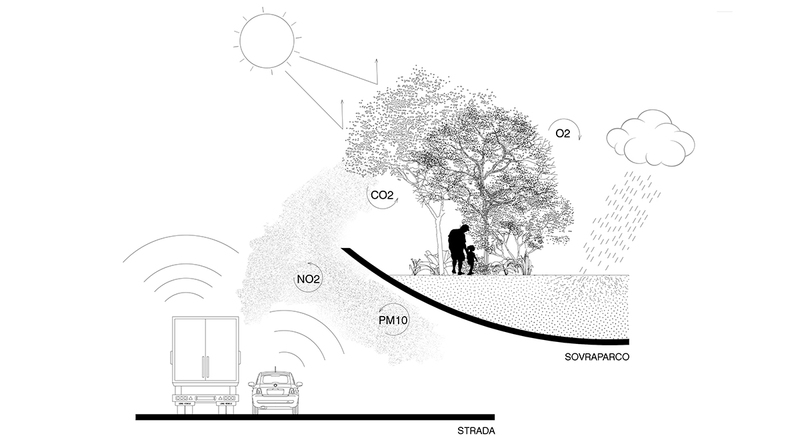 In the urgent context of need of permeable land and vegetation for our cities, it is quicker to add, rather than to substitute. Like a planet hosting a natural oasis, the garden is floating over the plaza; as it is a reversed shell, nothing is visible from the inside, but the sky. 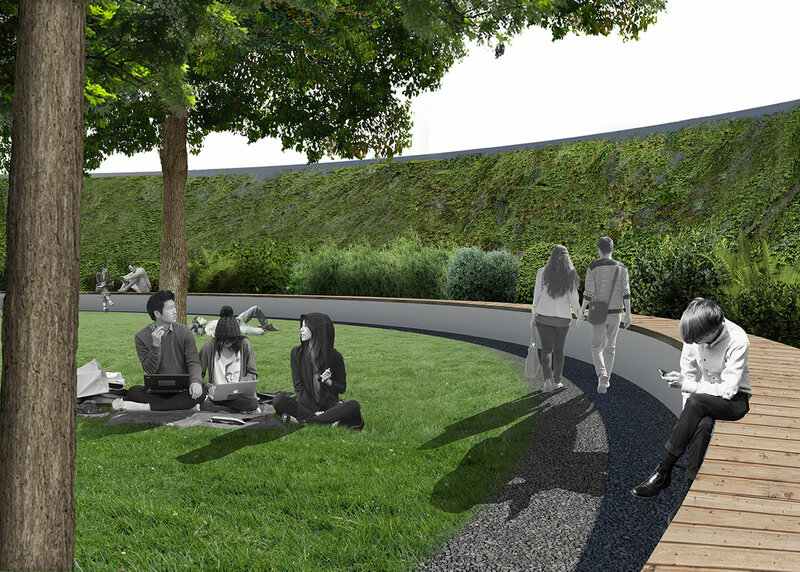 The borders protect people from pollution and traffic noise, generating a relative isolation inside, which has had success in many elevated parks in the World, from the Promenade Plantèe in Paris, France, to the High Line in New York City. The access to the shell in possible through stairs and an elevator. 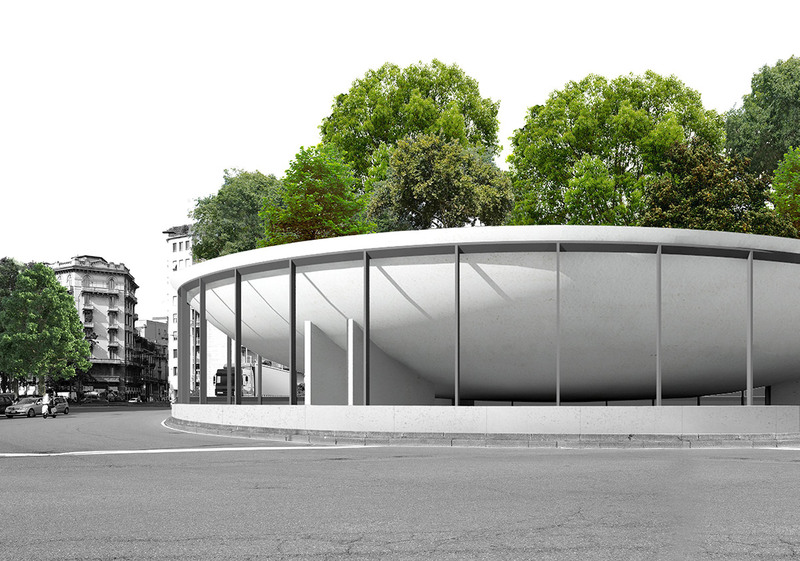 Once inside the shell, the garden is organized on two flat levels. The first level hosts stairs and elevator, as well as some services and covered spaces. 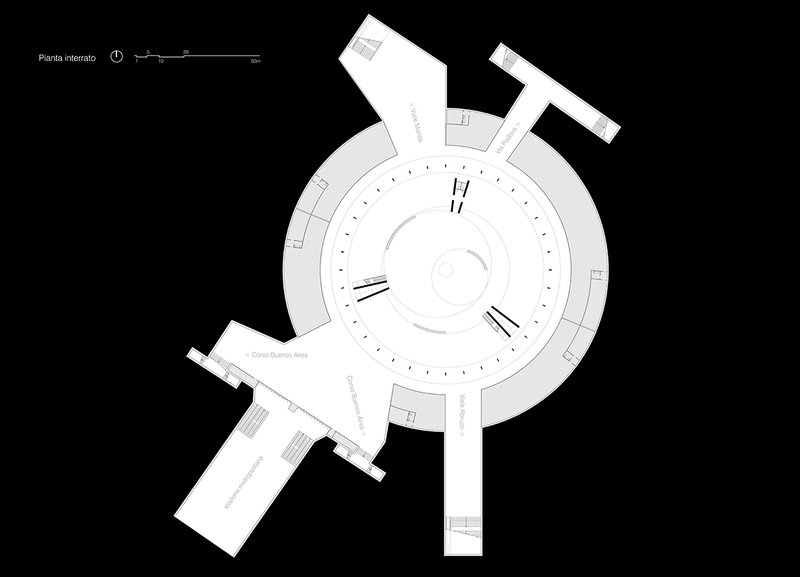 In its center there is a large oculus, opened downwards to the plaza underneath, which in a certain way reverses the spatial logic of the Pantheon in Rome; a ramps system leads to the second level of the garden. In the Sovraparco’s garden it is possible to relax, to read or even to organise small parties, but the formal circular power, never minimize its monumental image. 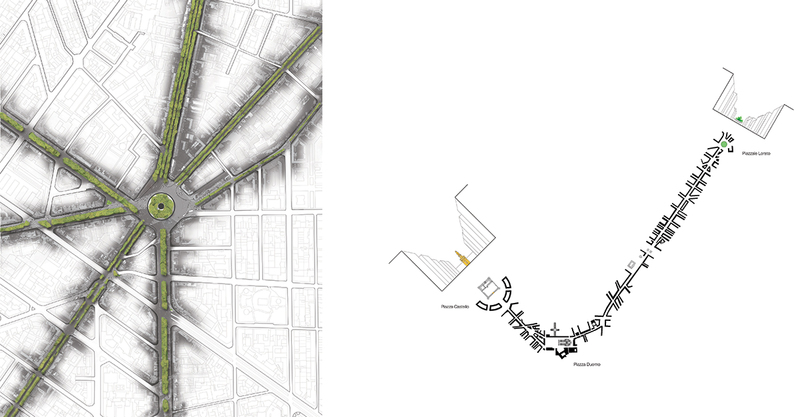 Like the Filarete Tower establishes its spatial relationships both with the Castello Sforzesco, and with th road that leads to the Duomo, our project aims to valorize Corso Buenos Aires as perspective focus of high symbolic value. 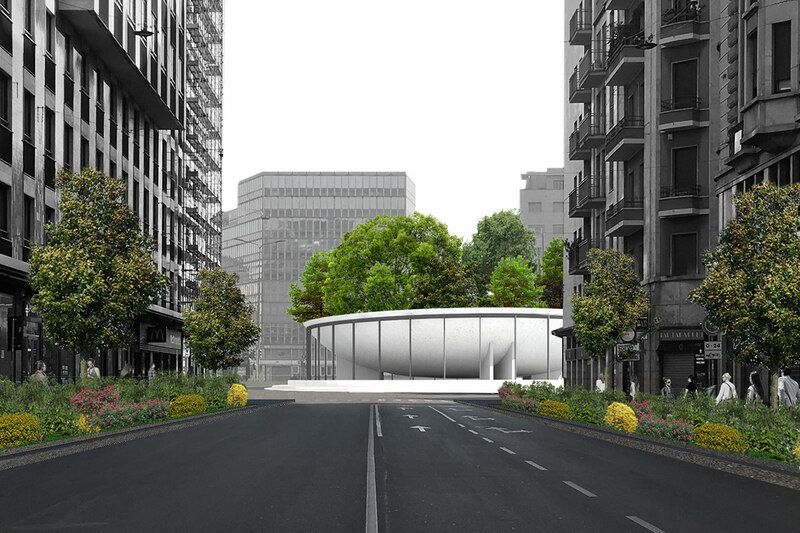 The background of the most important commercial street in Milan does not have to be an abandoned building, but a luxuriant park, an urban forest, which hosts plants, animals and human beings. 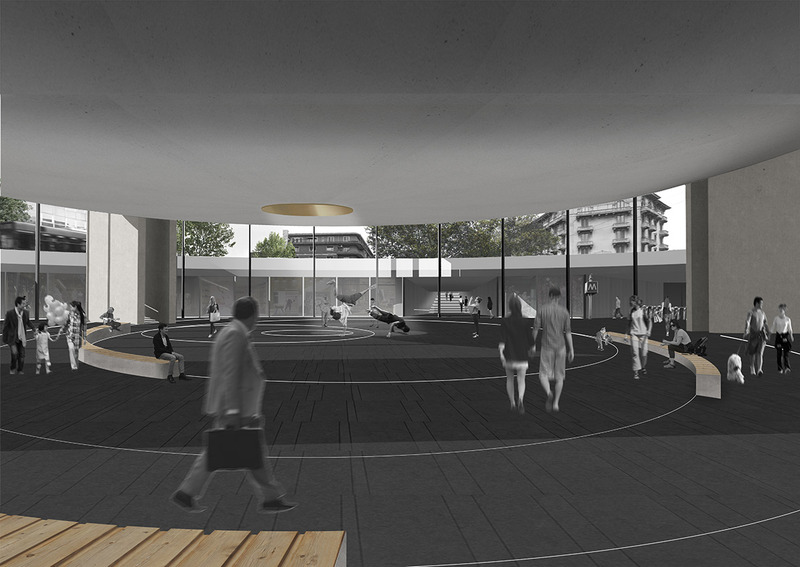 In synthesis, the park and the plaza are “public” spaces, but they also have the characteristic of being “free” spaces due to their access and their use. This connotation brings us closer in some way to what Yvonne Farrell and Shelley McNamara have called “freespace”, researched in their Biennale d’Architettura exposition in 2018.